Organic Places to Stay has over 500 accommodation entries in the UK & Ireland, to help you find the perfect organic accommodation. This book tells you if meals containing organic produce or fresh organic produce to buy are available either on-site or within five miles of your holiday accommodation. Linda Moss created www.organicholidays.co.uk ten years ago, and in 2004 her website won an Environmentally Friendly Website Award. She is married with three grown up children and two grandchildren, and has lived in Guiseley, West Yorkshire all her life. An excellent eco-friendly travel guide tool - I wouldn't be without one. (Lizzie Myers - Huntstile Organics). This book is probably the most complete and useful guide for people interested in an health holiday and pure meals. Very interesting and thoroughly researched book. A great contribution to a better world, where we care for our environment. Jolanda Beringen, ECEAT. A first class objective read, packed with useful information. Invaluable guide to holidays where the good life matters. I very much like this book and have found Linda and her web site very helpful. As a telephone volunteer for (Electorensitivity.org) people who have severe sensitivities I am increasingly being asked for details of accomodation that is chemical free and not in vicinity of mobile phone masts, wifi etc. This is extremley difficult and Linda has been most helpful. Thank you. Linda Moss has put together the perfect resource for a new wave of environmentally-thoughtful travellers. There's no erroneous embroidered 'fluff' to wade through either, the book is fact-packed with all the information you need to choose a holiday destination that will tick all the boxes that are important to you, your family and the planet. Tracey Smith - writer/broadcaster sustainable living and author of The Book of Rubbish Ideas. Extremely useful & well laid out guide to some fabulous accommodation. A very original idea for a book in this world of saving the planet, going green and organic. Well done. Nice photos. A very genuine holiday guide - you will not be disappointed. If you like to live,travel and stay healthy then this little book is an absolute "must have". Great guide written in plain and simple English. A great book from both points of view - for those in it who follow the organic ethos and those who travel with it. Organic = caring. I've had this book for a couple of years now and have used it on occasions. My only regret is that there aren't more organic places to stay! A great companion to have for those spur of the moment breaks away. As a foodie I love to sample the local produce and enjoy discovering new places to stay. This book is terrific. All B and B's and other places to stay throughout the world should be organic. I don't think any food should be riddled with pesticides. Food that is grown with pesticides should be illegal. It's a great book Linda. I refer lots of consumers who are looking for organic holidays to buy it (and I even mentioned it in a letter to the Guardian!) Look forward to the next one! A marvelous effort and a valuable resource. Its abit like your own yacht - you don't have to use it but you know you can when you need to. Well done Linda. This book will inspire many people to go organic.It deserves an award. Linda has devoted years to the promotion of ethical and organic places to stay and richly deserves her book to be recognised. A very well thought out and artistically presented book which is of great use to organic enthusiasts like myself. Long may you continue to keep updating it. A fantastic idea in an area not previously researched. A very useful book, well resourced, well written, and very well presented. Well done Linda, I hope lots of people recognise the huge amount of effort you have put into producing this fascinating and very useful resource and cast their vote for Organic Places to Stay. best wishes, I love the book. I absolutely love this book, a comprehensive guide to organic and sustainable holidays, I've already booked my first weekend break away - thanks Linda for making my life so easy! 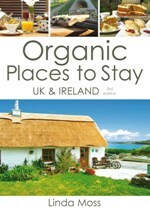 I heartily applaud Linda's vision and can highly recommend this comprehensive selection of organic holiday properties. In fact I will be checking through her listings and aim to try one out the first chance I get! This is a really well presented guide for holidays and short breaks with an emphasis on green and organic flavours and without any compromise as to quality and comfort. If you are serious about staying in good quality accommodation offering the finest organic produce and excellent service, this book is the one for you. This is a wonderful guide book which leads you to excellent personally-run guest houses with character and soul. I found it first rate. What a wonderful guide this has proved to be. An essential travel guide for anyone who cares about the environment. Great source for responsible holidays supporting those who are making a difference in our world. Highly recommended. Informative book helped us find some real gems that we will revisit time and again. Great book - well alid out and good for people wanting a greener holiday. A great book offering quality and ethics; I keep a copy in my travel bag for all UK travel and have given it to all my friends who were so pleased such a book existed!